We / Us / the Company" become Doorstephelp. "You" would include: providing services to the customer (eg, a person or organization that we and our service providers agree to provide). Service applications can be stored electronically or by phone at doorstephelp in standard format. Make sure your information is accurate to ensure the services are delivered on time. Services are provided between 9.00 AM TO 7 PM in your area and may be able to provide limited services in your area. We cannot offer services for public holidays and other limited holidays (which may vary from state to state). After receiving your Internet service request is required and / or received over the phone, we provide a Service Request Number (SRN) that will be used to track the progress and status of the service. All Servicemen carry a ID CARD issued by us bearing their name, photo and the name of the service provider. You must verify their identity before granting the servicemen access to your facilities to provide the requested services. You must keep the employee under your direct supervision and supervision for the duration of the supervisor's presence until the services have been completed. If you have doubts about your identity, do not allow affiliates to access your facilities and call our toll-free number immediately. We are not responsible for any loss or damage suffered by you if you grant access to a person who does not hold an ID issued by us or if you do not verify the identity of the person responsible. All servicemen are obliged to behave professionally and correctly towards the customers. If you have a comment on a technician, please send your comments to feedback@Doorstephelp.com. Services only include work. Parts and materials are not included. From now on, Doorstephelp will not manage any parts or materials. You must purchase the parts or materials required to perform the service. If you are unable to obtain the required parts or materials upon your request, the Administrator may purchase parts and materials needed to implement the Services, and it is anticipated that the parts or materials provided will actually be billed. The servant will give you an official invoice as proof of purchase. However, if these parts or materials are defective, malfunctioning or fail to function as intended, we will not be responsible for any warranty, replacement or repair of these parts or materials. If the materials or components are purchased as a result of the work you have given us to receive and cancel the order request, fees will be charged for the materials or items that you have actually purchased. A fixed visit fee for the requested services is Rs 149 (One forty Nine Rupees Only) to visit your partner for your facilities, to pay when booking your request through Doorstephelp or when the technician arrives at your Place. In addition to the fixed attendance fees, a service charge will apply and the employee will inform you prior to commencing work. After you have confirmed your service charge and the maintenance debtor begins to service, you will be required to pay the service fee that you request from the technician at any time. The fixed visit fees are adjusted on the basis of the service costs, so that a fixed attendance fee is at any time the minimum payment to be paid. The service fee you pay does not include the cost of any parts or materials required to complete and perform the requested service. These costs are your responsibility, with the exception of service charges. Fixed Visitor Fees are non-refundable and apply in case of cancellation for any reason as the person has arrived with you. (For example, if the material needed to provide the services is not available to the customer, the fixed fee must be paid.) We may, at our sole discretion, pay a fee of Rs. 50 per half-hour after the first half-hour if the technician is waiting to do his job, according to your instructions or because of the unavailability of parts and materials. We do not charge a fixed visit fee if the administrator cannot perform the services you requested. If our administrator can run the services but you do not want to continue or cancel the service request after the arrival of your supervisor, you must pay the fixed attendance fees and the cost of the parts or equipment you have bought for yourself. If you fail to pay the fixed fees or other applicable fees for the services provided, including, but not limited to, the part or material ordered, we reserve the right to collect the amounts due and we may also create a blacklist. Add to the right to terminate other services in the future and cancel other outstanding service requests. After Doorstephelp has received the money from you, issued a receipt from the B2C Take-Off Book, and received it from independent professionals, Doorstephelp is not responsible for the money that they received without prior approval as indicated. The follow-up or confirmation of the services provided by the servicemen must be reported to us via Doorstephelp, or you can call our toll-free number to save time and money. We are not responsible for reservations made directly by the customer to the administrator, as Doorstephelp in these cases has no control over, and in this case, assumes no liability for, loss or damage. By using our services, you agree to receive on your mobile phone and in emails text messages with your work status and any special offers available to you. You can unsubscribe from this service at any time by contacting us. We will not send you spam. We offer a 10-day limited warranty for work performed by a technician. Our warranty for work performed by a technician will terminate if our work is repaired, modified or handled by anyone other than us. If the defect is registered directly with Doorstephelp or our call center during this limited warranty period and a proper work schedule has been received, any work performed due to a partner error will incur no additional service charge. A new service request will be made together with the applicable service charge for each additional visit to perform additional or additional work on the work already performed, unless it results from our mistake.  Doorstephelp is not responsible for the work of the customer commissioned by the customer, despite the technical advice. All disputes, disputes and / or other assumptions relating to DoorstepHelp services and / or terms and conditions are governed by and construed in accordance with the laws of India. The parties are subject to the exclusive jurisdiction of the courts of New Delhi. We reserve the full right to change our fees and costs, and / or these terms and conditions may change without (i) notification, (ii) transfer of cause, or (iii) liability. Updated costs can be found at www.doorstephelp.com. We are not obliged to inform each customer or service provider individually about these changes. In addition to these terms and conditions, Doorstephelp may impose other specific conditions at any time to respond to unforeseen circumstances. We also reserve the full right to change prices and / or terms and conditions without cause and without liability. Members and users are encouraged to refer to these potential changes posted on www.doorstephelp.com . We are under no obligation to notify each customer, service provider or service user individually about these changes. We reserve the right to cancel a service request at any time for internal and external reasons.